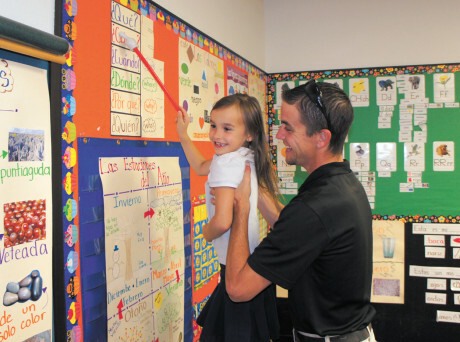 Alannah Monfred, 7, shows dad Robert Monfred her skills in Spanish during an open house inside dual-language teacher Nancy Leon’s first-grade class at Madison Heights (photo by Teri Carnicelli). In 2000, Arizona voters passed a ballot measure stipulating that instruction in public schools be offered only in English. Bilingual teachers who had been instructing in Spanish were told to switch to just English beginning with the 2001-02 school year. However, there was a lot of confusion based on the language of the proposition, and while some school districts did change their approach to educating their English Language Learners (ELLs), many of them continued to teach their ELL students in Spanish and English. In the end, public and educational support for the law dwindled, and it mostly remains unenforced today. In fact, you could say that there has been a pendular swing in the opposite direction. These days, dual-language programs at elementary schools are in hot demand—for English-speaking families who want their children to learn Spanish. Language immersion is a method of teaching a second language. Instead of teaching the second language as a distinct subject, immersion teachers use the second language as the mode of instruction generally for one or two core subjects, such as math and science. Students typically spend half their day learning subjects in one language and then switch after lunch to learning in a second language. Public schools that offer these programs generally have two or more classrooms dedicated to the dual-language learning at one or more grade levels. The classes could be considered an elective, in that parents have to formally register their children for the dual-language program. One North Central school district has been offering its dual-language program before the 2000 ballot measure, and it continues to have strong demand from families both inside and outside the district boundaries. Encanto and Clarendon Elementary Schools, in the Osborn School District, abut each other and share a cafeteria. They also have a contiguous dual-language program that starts in Encanto’s K-3 grade levels and continues in Clarendon’s 4-6 classes. Dual-language is offered in all subject areas, and two dual-language classrooms are offered per grade level. The program was first launched at Encanto in 1998. “More and more parents want their children to be bilingual at an early age.”Carlos Ardón, language acquisition specialist for the Osborn School District, says nearly 40 percent of the children enrolled in the dual language program are from out-of-district. In fact, he said there likely will a waiting list for those looking to enroll their kindergartener in the dual language program this school year. “The climate has shifted, as more and more parents want their children to be bilingual at an early age,” Ardón says. The Arizona Educational Foundation awarded the Osborn Dual Language Program the A+ Exemplary Program Award in 2010. Also receiving recognition for its dual-language program is Biltmore Preparatory Academy, a public K-8 school in the Creighton Elementary School District. Its Foreign Language Immersion (FLI) program has resulted in the highest increase in enrollment of any school in the Creighton district over the past several years. The program starts in the 2010-2011 academic year for kindergarten and first grade, when the school was called the Squaw Peak Tradition Academy, and an additional grade has been added every subsequent year. In 2010, when the FLI program began, total enrollment at the school was 238 students. At the beginning of the 2012-13 school year, it had swelled to 408. For this school year, enrollment has grown to 520 students, and administrators credit much of the growth to interest in the FLI program, which had 252 students enrolled last school year and has 337 enrolled for this school year, with a waiting list. School officials say the program has been astonishingly successful and popular with both students and parents, from both within and outside the Creighton School District. As with most public school districts in the Valley, Biltmore Prep offers open enrollment. However, “Enrollment in the FLI Program is on a ‘first come, first served’ basis after we have honored Biltmore Preparatory Academy’s attendance area families,” explains new Biltmore Prep Principal Joel Laurin. And most recently, the Madison School District has started offering dual-language instruction. At Madison Heights, the Spanish immersion program was begun in first grade only, and with just the science curriculum, in the 2012-13 school year. So the program was expanded to second grade, and included the subjects of science, social studies and language arts. Both kindergarten and third-grade dual-language classes are being offered on the Madison Heights campus this fall. Ultimately the fourth and final grade at the school will be added so that all grades will have the option to be in Spanish immersion for part of each school day. To help parents understand what their children are doing in these dual-language classes, Madison Heights hosted a Spanish Immersion Festival of Learning in its multi-purpose room on April 29-30. The children performed songs and skits in Spanish for their families, with some of the children translating in English. Afterwards, the families were invited to the dual-language classrooms to see some of their children’s work. The Madison School District is exploring what to do as these Spanish-proficient students transition into the district’s middle schools, which currently only offer Spanish as an elective course. We have three children attending Creighton’s Biltmore Prep Academy, and it’s amazing how much they intuitively and naturally speak and write in Spanish now that they are in the 4th and 5th grade. All entering 4th grade students are able to apply for the “Biltmore Prep – Hermosillo Exchange Program” which is a part of the Creighton School Districts Jr. Ambassador Program. In the beginning of the year, this new student exchange program matches them up with 4th grade students from Hermosillo, Mexico who they email, and correspond with (in Spanish) throughout the year. Then they get to meet each other in person. In November the students from Hermosillo come to Phoenix, and in March the Biltmore Prep students travel to Hermosillo, Mexico. For 5 days they travel, go to school, visit cultural sites, museums, and become a “family member” of a host family for a whole day. Last year was our first year in the exchange program and we can’t advocate enough for what a remarkable and impressionable program this is and how much fun it was for both schools’ students and schools. Our exchange program gives our students a first hand experience in applying their language skills and interpersonal skills in becoming the global citizens we had hoped for in a dual language school at such a young age.